It was however one of the most influential, innovative and well-regarded companies of the pre-Grouping period, left unique legacies in terms of design and operation among others, and had some very important engineering figures in its employ over the years, some of whom we’ll explore in future articles. 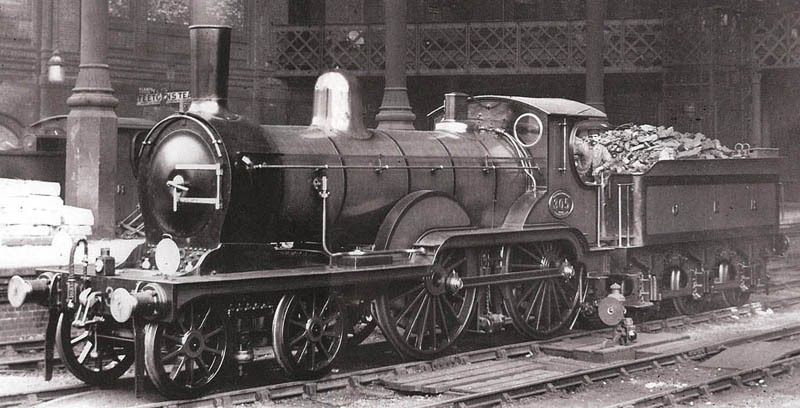 It was also the home of the most attractive locomotive ever built; the C8 class 4-4-0s. These were the first inside cylinder 4-4-0s built in England, and for the final decade of their existence combined the best attributes of many of the company’s previous Locomotive Superintendents. Originally designed by SW Johnson in 1874 just prior to his joining the Midland, they incorporated his successor, William Adams’ bogie and cab side-sheets, and as rebuilt in 1888 by Holden had Worsdell’s standard boiler fittings, Holden’s boiler and wore his revised ultramarine blue livery. No.305 finished its career as station pilot at Liverpool Street, and no.306 as the pilot at Tottenham for the St. Pancras traffic. There is a link; no.305 will eventually be seen working through Basilica Fields. After all, how could I resist? Class C8 no.305 in its final years as station pilot at Liverpool Street. *This post was written before the event and scheduled to be posted on the anniversary.